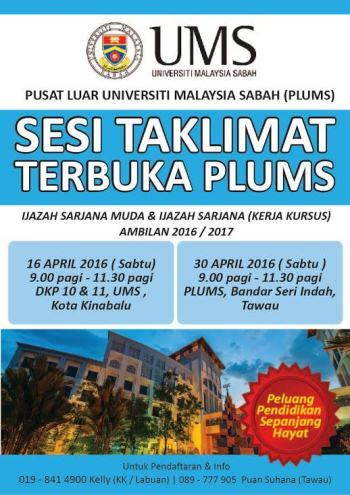 FRIDAY, 15 APRIL – Universiti Malaysia Sabah (UMS) Centre for External Education (PLUMS) will hold a series of open briefing starting tomorrow at the Main Lecture Hall 10 & 11, UMS, Kota Kinabalu. Its director, Associate Professor Dr. Hajah Arsiah Hj. Bahron said the talks were aimed at providing information about the programmes offered by PLUMS; Bachelor ‘s and Master’s Degree (Coursework) this coming September 2016/2017 academic session that is currently opened. “Besides the briefing in Kota Kinabalu, a series of briefings will also be held at PLUMS Tawau Learning Centre on 30 April, UMS Labuan International Campus (7 May) and UMS Sandakan Campus (14 May),” she said in a statement. She said, PLUMS invite all interested individuals to attend the special briefings to get further information regarding the programmes they wish to apply. According to Dr. Arsiah, among some of the information that would be shared were synopsis of programmes, admission requirements, registration methods and financial aid. “In addition to targeting working adults, PLUMS programmes are also open to Sijil Tinggi Persekolahan Malaysia (STPM) holders, as well as Diploma holders who are seeking to further their studies at degree level with lectures conducted off-campus on weekends. “PLUMS as a centre for offering lifelong education programmes also provide an opportunity for graduates to pursue Master’s Degree (by Coursework) where lectures are conducted in the evenings and weekends,” she added. For those who are interested, please download the form by visiting the website at http://plums.ums.edu.my for bachelor’s degree or master’s degree at https://smpp.ums.edu.my/application.